Alfred married Agnes Hopkins (25) at Buckland Ripers Church on 26 December 1905. In addition to AG Boggust: WT Doylend and Reginald Northover, Broadwey men were onboard. Dalmeny and South Queensferry Cemetery contains 180 First World War burials, almost all of them naval. 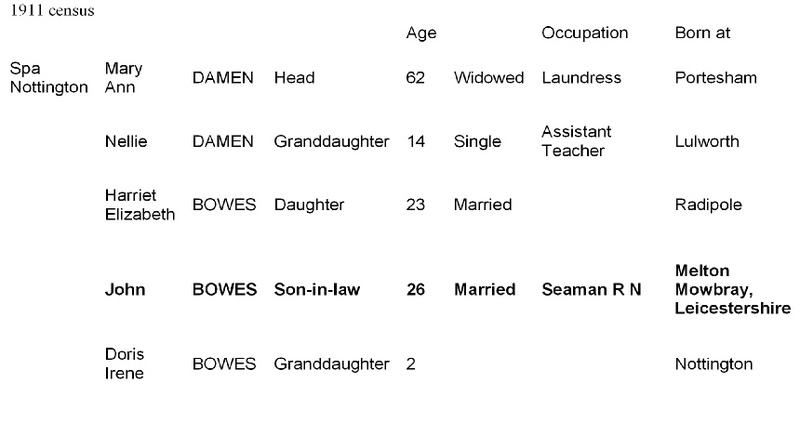 Son of Mr J/Mrs L Bowes, 49 Rosebery Ave, Melton Mowbray. Officers and Men Killed in Action or Died of Wounds, H.M.S. Ardent, Battle of Jutland 31st May -1st June 1916. The Dorsets in 1917 - Operations on the Ancre, The Battle of Messines, The Battle of the Langemarck, The Battle of Polygon Wood, The Battle of Broodseinde, The Battle of Poelcapelle. Country died/cemetery or memorial: Belgium, TYNE COT MEMORIAL, Panel 92. 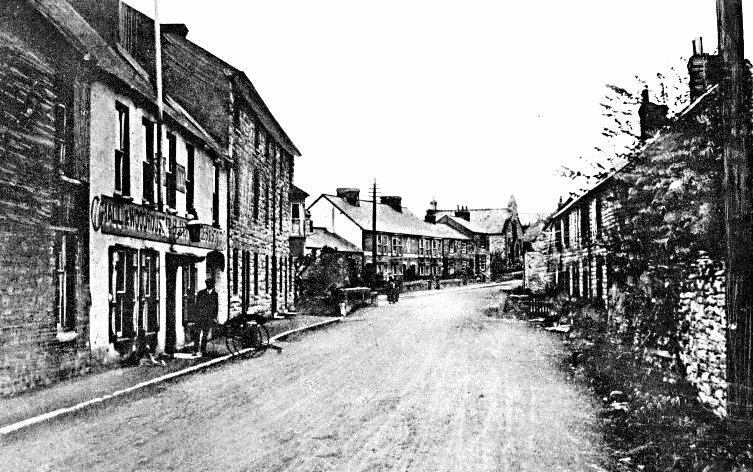 Hope was born Bridport in 1880, married Agnes Pearce in 1899, The family lived in the Bridport area until around 1914 when they moved to Westbrook, Upwey. Hope was a gardner. They had at least four children: - George William born in 1900 (Beaminster); -Gladys Rhoda Emily born in 1903; -Leonard Percy Henry Hope born in 1906; -Phyllis born in 1909. Hope and family lived in the cottages opposite the Swan on Dorchester Road, demolished probably late 1960's. Regiment: Royal Garrison Artillery, 35th Siege Bty. First went to France in September 1915. Siege Batteries RGA were equipped with heavy howitzers, sending large calibre high explosive shells in high trajectory, plunging fire. The usual armaments were 6 inch, 8 inch and 9.2 inch howitzers, although some had huge railway- or road-mounted 12 inch howitzers. As British artillery tactics developed, the Siege Batteries were most often employed in destroying or neutralising the enemy artillery, as well as putting destructive fire down on strongpoints, dumps, store, roads and railways behind enemy lines. Country died/cemetery or memorial: ABBEVILLE COMMUNAL CEMETERY EXTENSION, IV. J. 4. For much of the First World War, Abbeville was headquarters of the Commonwealth lines of communication and No.3 BRCS, No.5 and No.2 Stationary Hospitals were stationed there variously from October 1914 to January 1920. The communal cemetery was used for burials from November 1914 to September 1916, the earliest being made among the French military graves. The extension was begun in September 1916. Son of William Buchannan Carlin of 47 Clyde Street, Port Dundas, Glasgow. Husband of Lily Rose Dawn CARLIN (nee Warren), of "The Laurels," Laurel Lane, Upwey. Regiment: Royal Engineers 9th Div. Signal Coy. Country died/cemetery or memorial:France, LA KREULE MILITARY CEMETERY, HAZEBROUCK B. 25. La Kreule Military Cemetery was opened in April 1918 by the 1st and 2nd Australian Casualty Clearing Stations, which came back from Outtersteene ahead of the German advance, and the 17th, which arrived from Lijssenthoek. These three stations, known collectively as "Ana Jana Siding", were posted to the north of La Kreule, but in the middle of April they withdrew to Blendecques, near St. Omer, and the cemetery was then used by heavy artillery and fighting units. Son of Mr. F. and Mrs. C. Carpenter, of 8, Pretoria Terrace, Chickerell Road, Weymouth, Dorset. Regiment: Hampshire Regiment 2nd/7th Bn. Formed at Bournemouth in September 1914 as a home service ("second line") unit. Became part of 2/1st Hampshire Brigade in 2nd Wessex Division. Country died/cemetery or memorial :Iraq, AMARA WAR CEMETERY XII. K. 12. Amara was occupied by the Mesopotamian Expeditionary Force on 3 June 1915 and it immediately became a hospital centre. The accommodation for medical units on both banks of the Tigris was greatly increased during 1916 and in April 1917, seven general hospitals and some smaller units were stationed there. Son of Enoch J. and Clara Maud Christopher, of The Cottage, Bincombe, Dorchester. Before moving to Elwell Street to run the market garden after his father's death, Enoch and Clara Maude Christopher had strawberry fields at Bincombe. Beryl Christopher married Thomas Fellowes. Sadly they lost their son Peter in WW2. A description of a visit to the nursery. A Jaunt to Upwey in 1881 - After visiting the Wishing Well we are set down at Mr Christopher's nursery, in the midst of so much that was worthy to be seen we scarcely knew which thing to gaze at first and which to reserve for the parting peep. I was only sure about this, that it was utterly impossible to take a 'fair look' at all the floral, fruity and vegetable wonders of the nursery and return to Weymouth that night, even though we lit candles for the purpose as soon as the sunlight went out. We occupied every second of the time advantageously, even to those expended in participating of the hospitality of the right good lady of the house. In the free and pure open air more roses than I could count were blushing and breathing such incense as would be more likely to enrapture me than all that ascends from altars built by vain man. Varieties of roses included: General Jacquemenot, Gloire de Dijon, Jules Margoten, John Hopper, La France and Duke of Edinburgh. Mr Christopher has such a collection, rare and varied of pansies as I have not praised for some time. This meek-eyed flower blooms in almost all its known varieties. His petunias and dahlias are healthy looking and full of colour. Under the many yards of glass which extend along the fruitful nursery grow the well-tended and heavily laden vines in companionship with the pelorgonium, the calceolaria, the ivy leaf and a hundred other geraniums, the climbing stephanotis, the graceful fuchsia in all its species, the fern. I could not catalogue the thousands of leafy marvels which are propagated and trained under that glass. Water is plentiful there being a small well in almost every glass house. Outside we praised peas, potatoes, cabbages and asparagus. Good fortune and kindly treatment seem to have worked well together for the fruit trees. The blossoms are fast giving place to the young apple and pear. Gooseberries, red, black and white currants grow well. In truth I am of the opinion that Mr Christopher's nursery promises to yield him the plenteous harvest he deserves. His lobelias, gladiolas, roses etc are as excellent as somebody told me his cheer is, and that I believe is saying ever so much for them. Regiment: Canadian Infantry, 52nd Bn. After the war, the highest point of Vimy Ridge was chosen as the site of the great memorial to all Canadians who served their country in battle during the First World War, and particularly to the 60,000 who gave their lives in France. It also bears the names of 11,000 Canadian servicemen who died in France - many of them in the fight for Vimy Ridge - who have no known grave. SON OF Enoch James and Clara Maud CHRISTOPHER, OF UPWEY, DORSET, ENGLAND. Regiment: Royal Sussex Regiment, 2nd Bn. The 2nd Battalion crossed the channel with the British Expeditionary Force in 1914 and fought through the war on the Western Front. It was during the first Battle of Ypres that the 2nd Battalion was given the unofficial title "The Iron Regiment" as an unsolicited testimonial by German prisoners captured on 1 November 1914. Country died/cemetery or memorial: France - LE TOURET MEMORIAL, Panel 20 and 21. Only son of William James and Ellen Jane Cosson, of 2, Westbank, Broadwey, Weymouth. Regiment: Essex Regiment, 1st/6th Bn. The 1/4th, 1/5th, 1/6th and 1/7th Territorial Battalions served with distinction on Gallipoli and in Egypt and Palestine, taking part in many hard-fought engagements with the Turks and gaining ten battle honours for the Regiment. Of the Honours, "Gaza" was won by these Territorial Battalions, who also share "Gallipoli" with the 1st Battalion. SON OF CHARLES CROCKER, (WIDOWER) OF UPWEY, DORSET. Charles married again in April 1911 - Louisa Vine and had 2 sons Walter Cecil and Howard. Service: Royal Navy H.M.S. "Attentive." Country died/cemetery or memorial: Belgium, RAMSCAPPELLE ROAD MILITARY CEMETERY, VIII. D. 9. From June to November 1917, Commonwealth Forces (XV Corps) held the front line in Belgium from St.Georges (now Sint Joris), near Ramskapelle, to the sea. Son of William Arthur and Minnie Day, of Meadow View, Elwell St., Upwey. Rank: Acting lance corporal - Samuel enlisted at Dorchester. In the Mesopotamian campaign General Maude chose September 1917 to deliver a knockout blow to the Turks at Ramadi. A previous attempt ain August, in temperatures of over 122 degrees in the shade, had failed. The Turks had established a garrison at Ramadi, comprising 100 cavalry, 100 artillery and 3000 infantry troops and were well dug in. The landscape was featureless, except for a few ridges that hardly earned that name. The 1/5 and 2/5 Gurkas supported by Dorset's were given the job of capturing Ramadi Ridge which was just 17ft high and the approach offered no cover. The attack was made on 28 September and the Gurkas had no difficulty seizing it, but on nearing the crest they came under heavy fire and were reinforced by some of the Dorsets. The men were very exposed to the Turkish troops just 1000yds away and had to endure artillery, rifle and machine gun fire; but after more of the Dorset's were committed to the fierce fighting the position was eventually secured. Son of Robert/Sarah Doylend of Lowestoft. In addition to WT Doylend; AG Boggust and Reginald Northover, Broadwey men were onboard. 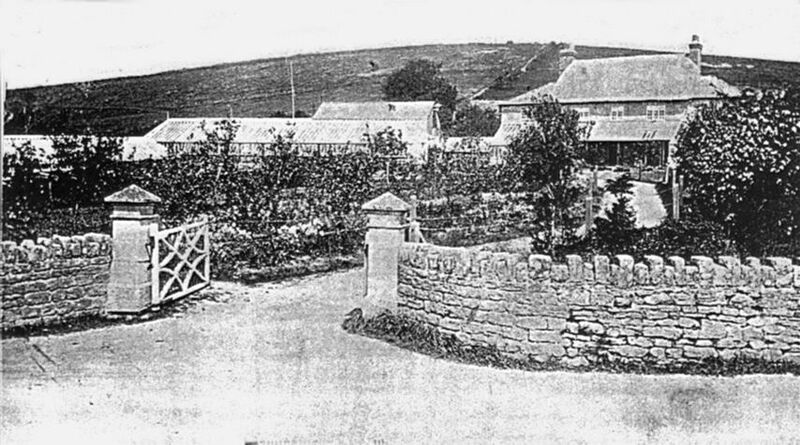 Elwell Nursery (86 Elwell Street) – Christopher’s until 1930’s then Warr’s, the greenhouses/outbuildings survived for some years before making way for a house.